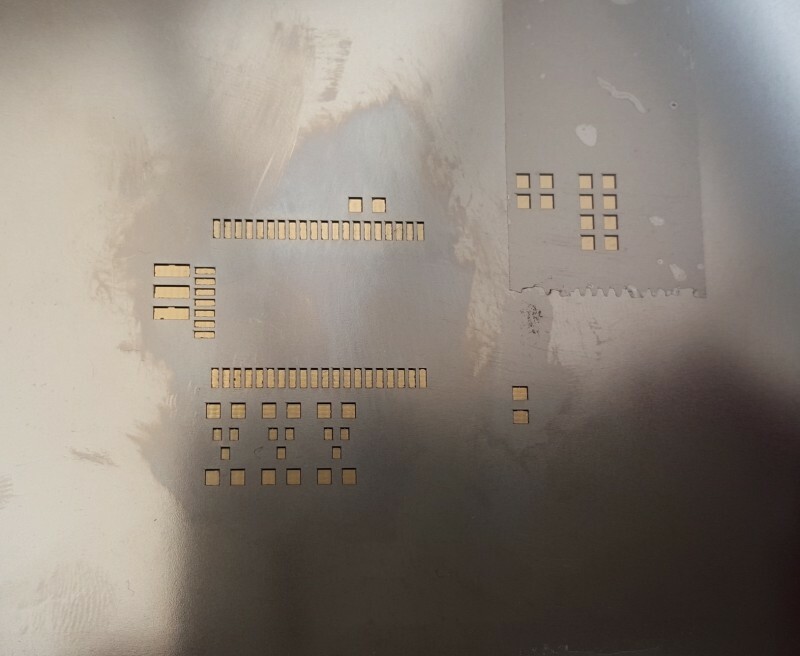 When getting PCBs produced, if you plan to build more than one board, then getting a stencil at the same time is a good idea. The one here is made from stainless steel. 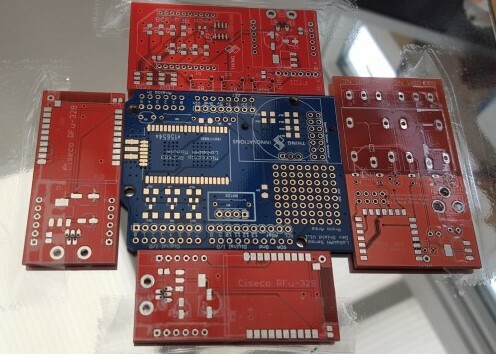 Using a flat surface, surround the PCB with a number of spare PCBs that are the same thickness. The stencil was lined up and a strip of tape placed at one end to produce a simple hinge. Another small piece is used to attached the opposite end. 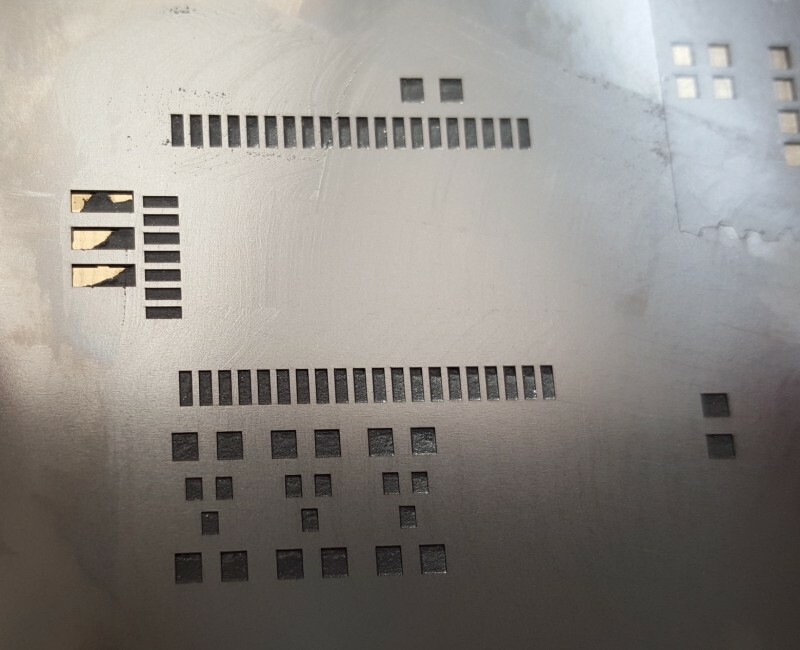 Apply solder paste to the stencil and while holding the stencil firmly in place spread the solder paste into the openings. 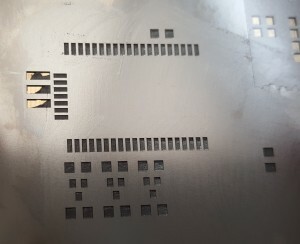 If the stencil lifts up then paste will fill the gaps between the pads. 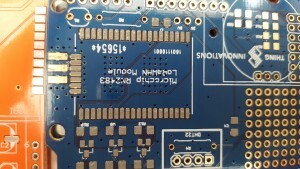 Any pads not required to be soldered, for example in this case the connector on the edge of the board, the holes can be taped up or the paste can be carefully removed afterwards. After carefully lifting the stencil, you should see the pads covered with the solder pasted. The components were removed from their packaging and put into groups ready for placement. 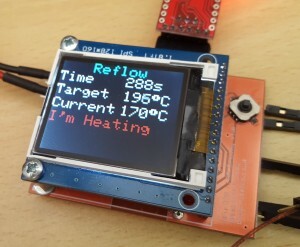 Fortunately for this design there are only 3 small components, resistors, FETs and capacitors all of the same value. 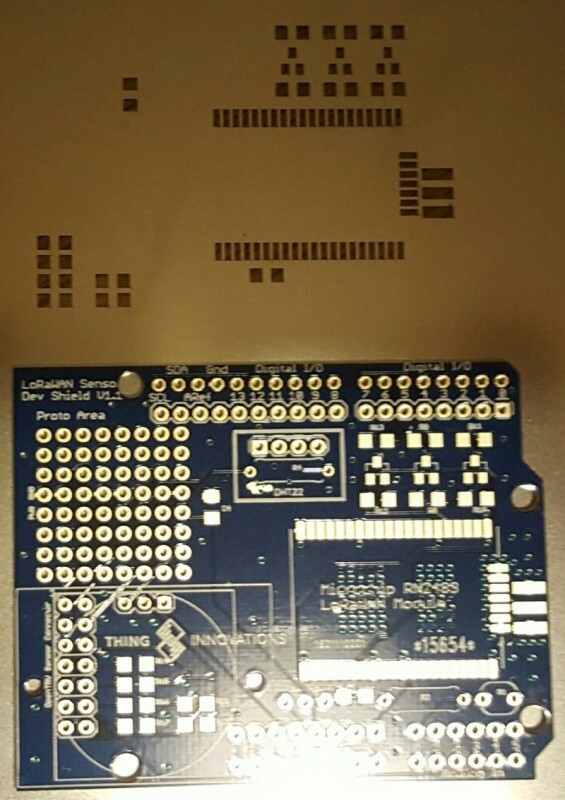 The larger RN2483 module is not shown. 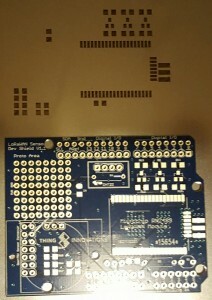 Components placed, close view. 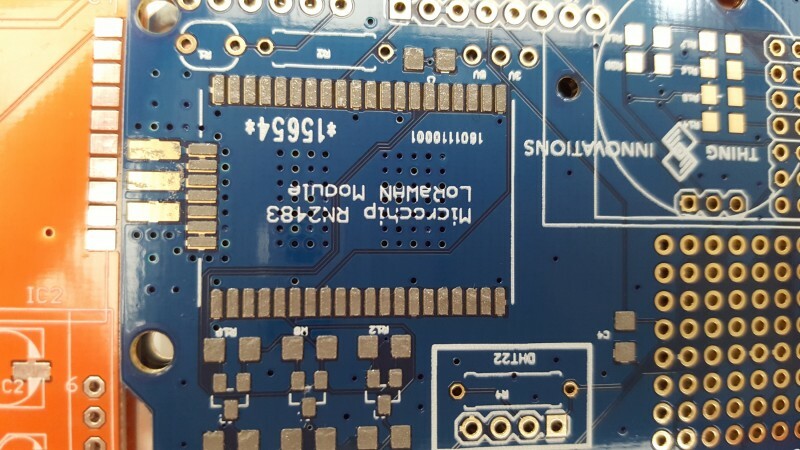 When placing them by hand I used a fine pair of tweezers and a cocktail stick to just push the component down into the solder paste. 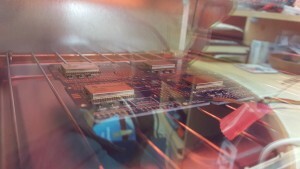 A number of boards ready for the reflow oven. 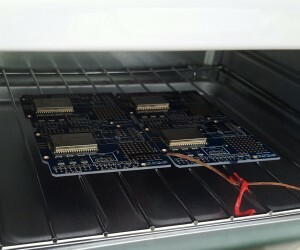 The boards were cooked in small batches in the centre of the oven. 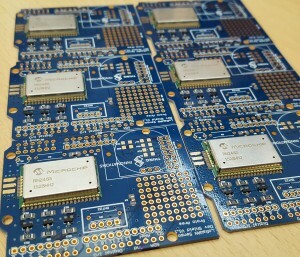 In total 10 boards were made in two batches of four and one batch of two. The thermocouple was positioned so that it was touching one of the PCBs to get an accurate as possible temperature on the PCB. 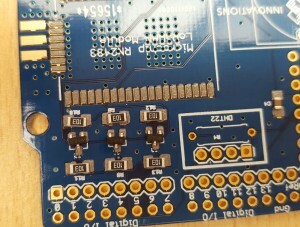 The simple controller shows the progress. When completed, the boards are allowed to cool slowly in the oven before removing them and letting them completely cool prior to inspection. Stack of boards ready for the next phase – hand solder the headers and through hole components. 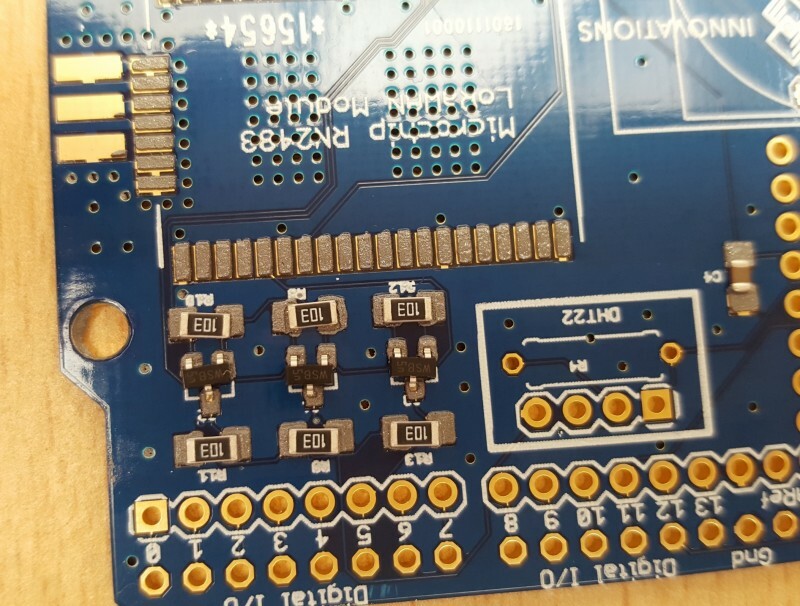 The end results were very good with all boards working correctly. The reflow oven is not insulated so this is an improvement to be made and may speed up the time it takes to get up to temperature.